The authors are requested to prepare their manuscripts as per the instructions/specifications given below. It should be noted that the review process is solely depend upon the significance of the work and the care used by authors to represent it, in the form of their manuscripts. Therefore, authors are strongly encouraged to read these instructions carefully before preparing/submitting their manuscript for publication. Manuscripts should be prepared as word documents in Times New Roman (font size should be 12) on A4 size with a margin of 2 cm of all four sides. The manuscript should be typed double-spaced including references and tables also. Title page: It should have Title, Name(s) of author(s) and their affiliations i.e. postal address, phone no., corresponding author’s email address(es). Abstract: It should have a brief idea of the manuscript and not exceed 250 words. Keywords: It should contain up to 5 key terms related to the research work. Introduction: It should represent the scope, objective and novelty of the research work. Experimental Section: It should contain information about the materials and the methods adopted to carry out the research work like animals, chemicals and animal ethical committee permission, software used and procedures followed etc. Chemical compounds should be named according to IUPAC or Chemical Abstracts. The units and dimensions should be expressed according to the metric system and SI units. Results and Discussion: It should contain summary of the research work performed, result interpretations and finally their conclusion. Acknowledgements: It should contain the information regarding any research grant support or the assistance of colleagues. Author's initials Surname. Journal, Year, Volume(Issue), Page No. CS Sharma; RK Nema; SN Meyyanathan. Academic J. Cancer Res., 2009, 2(1), 19-24. Author's Initials Surname. Title, Edition, Publisher, Place of publication, Year of publication; Page No. RK Nema, SN Meyyanathan; CS Sharma. A Practical Approach to Pharmaceutical Analysis, 1st Edition, CBS Publishers & Distributors, New Delhi, 2008; 89-90. For queries related to publication process and charges please contact us with your details (Including Country). 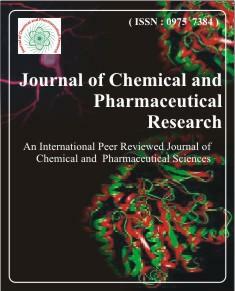 Submitting your manuscript/work towards the journal will be considered as providing your complete authority to editorial board/members to Reject/Publish your manuscript with respect to journal policies in Journal of Chemical and Pharmaceutical Research. The submitted work/manuscript should not be the one neither with substantially similar content under any authorship been published nor is being considered/under consideration for publication elsewhere.